Skiles credits the fact that the Bucks didn’t give up during the tough part of their schedule in January. Aldridge also talked to Bogut about his improvement, and the fact that Skiles is asking more of him this season. The Bucks are 18-6 over the last 24 games, and Bogut has been on a shot-blocking tear, bringing his average up to a career best 2.4 per game. Against the Celtics, AB was downright dominating, scoring 25 and grabbing 17 boards to go with four blocks. On TNT’s Inside the NBA last night, Kenny Smith tabbed Brandon Jennings for Rookie of the Year over the Kings’ Tyreke Evans and the Warriors’ Stephon Curry because he’s had more impact on a team many picked to finish last with a healthy Michael Redd. “Their best player,” Kenny called Redd. Nobody on the panel agreed with Kenny’s Redd assessment of course, led by Charles Barkley — he of the infamous “Is Andrew Bogut still in the league?” Barkley gave the ROY nod to Evans. But in doing so he finally gave AB his due. Kevin McHale also gave the nod to Evans. But despite the national buzz about Skiles, Bogut and Jennings (and John Salmons) Bucks fans in Milwaukee will open up their morning daily and read that Jerry Stackhouse has made the big difference. How do these things happen in Bucks media? And why do they happen? Needless to say, the usually stellar Tom Enlund was not responsible. 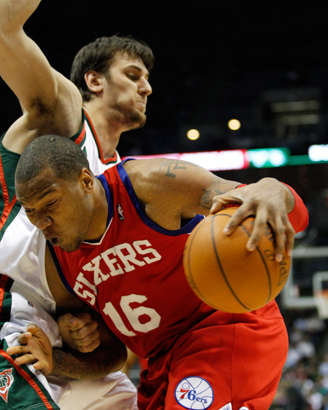 The Bucks are 18-6 since Stackhouse arrived, true enough. He’s helped the cause in a couple of wins and added to the depth. It’s a long season. But it’s difficult to see Stackhouse as much of a difference, not with Luc Mbah a Moute and Bogut playing as well as they’ve played over that stretch. Everybody’s contributing these days, except Charlie Bell, marooned on the bench. 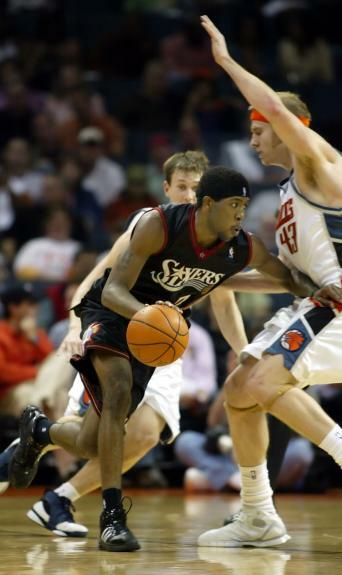 Since acquiring John Salmons, the Bucks are 10-1. Would the Bucks have lost a game or two with Bell playing Stackhouse’s minutes. I don’t think so, and in fact, the D Charlie blanketed on D-Wade contributed directly to a couple of those wins in the 8-5 stretch the Bucks had after their six game road trip West and before the trading deadline. More than anything, the Bucks just needed Michael Redd to take a seat on the sidelines. Bucks fans are almost universal in realizing this. But Journal Sentinel won’t come around to saying it. I can agree to being more positive about Stackhouse than I was when the Bucks picked him up. But fans need the daily paper to be a source of news, not a shill for whatever cover the Bucks and their GM require at the tail end of the Redd era. If you’re inspired to buy some Bucks tix, don’t do it for the minor Stackhouse factor. Buy them to see the first All-Pro center the Bucks have had since Kareem. And that rookie point guard Kenny Smith’s talking about on TNT. Note: Bob Lanier was never voted All-Pro in his career, though he was a 7-time All-Star selection, once as a Buck (1982). If Bogut continues to play like he’s playing now (no reason to think he won’t) he should make at least 3rd team All-Pro. Kareem, the Big O, Marques Johnson, Sidney Moncrief and Terry Cummings are the only players in Bucks history to make 2nd team All-Pro or higher. Kareem, Marques and Sidney were the only 1st-teamers. This entry was posted in The Jinx and tagged Andrew Bogut, Brandon Jennings, Charles Barkley, David Aldridge, Jerry Stackhouse, Kenny Smith, Michael Redd, Milwaukee Bucks, Scott Skiles, TNT on March 12, 2010 by J.D. Mo. “NBA fans, take a look at this guy Bogut,” said TNT analyst Kenny Smith after watching the highlight of Andrew Bogut blocking a driving Paul Pierce shot in the lane, snatching the ball and launching the outlet to half court where it found a streaking Brandon Jennings. So the Bucks are 34-29 and holding on to the fifth playoff spot in the East, hoping for a first round matchup against either the Celtics or the Hawks (for many reasons, Kevin Garnett chief among them, I hope it’s the Hawks). When the season started I didn’t think I’d be writing that sentence with 19 games to play, but there it is. Coach of the Year buzz (Smith again) is humming around Scott Skiles. And Andrew Bogut (25 pts, 17 boards and a lot of great D against the Celtics) is at last playing like the big center who was at the top of the draft boards in 2005. Bogut is now perhaps 2nd only to Dwight Howard as an NBA center. Like Dwyer said, Andrew Bogut has become Andrew Bogut. This entry was posted in The Jinx and tagged Andrew Bogut, Ball Don't Lie, Boston Celtics, Brandon Jennings, Charles Barkley, Kenny Smith, Milwaukee Bucks, Paul Pierce on March 10, 2010 by J.D. Mo.